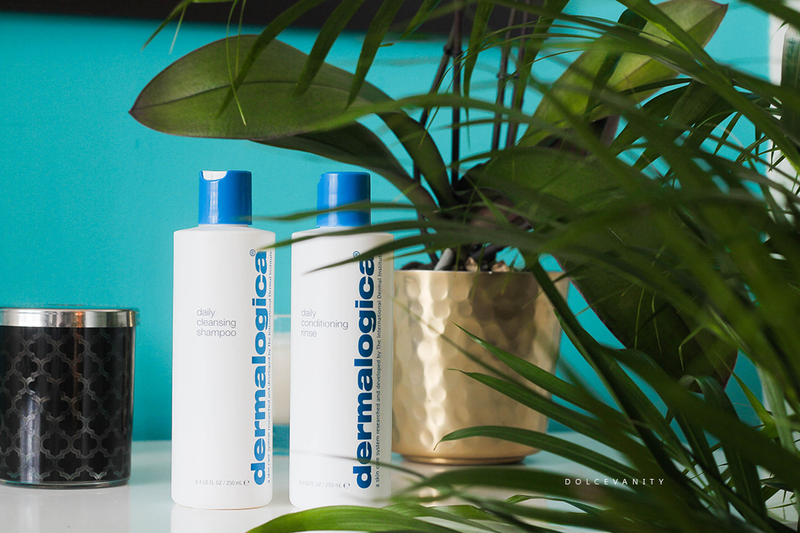 Dermalogica Daily Cleansing Shampoo & Conditioning Rinse. Dermalogica as we know do a lot of great skin care products. There's a couple I can't do without and I think these are another addition - Daily cleansing shampoo & daily conditioning rinse. The cleansing shampoo has zero sulfates meaning it's not stripping the hair of it's natural oils, for my hair or scalp to be dried out -even if I'm going to be putting products in afterwards- is a no go, I don't like my hair feeling like straw. As noted it's sulfate free so you may automatically feel there's no foaming action but if you're a person who likes to see their product foam, this does foam. Foam doesn't bother me, I can take it or leave it. Once applying this to my roots and massaging on the scalp, I then bring it down to the mid sections and rinse out, it does a good job of cleaning my hair pretty quickly. Once rinsed out my hair doesn't feel stripped or dry - sometimes I skip shampoos and co-wash especially if I don't have product buildup cos some shampoos sulfate free, can leave my strands feeling dry & I'm happy to say not the case here. Leading onto the conditioning rinse, it gives a good slip so any further detangling isn't an issue, my fingers or wide tooth comb run through the strands and it feels as though my thirsty locks are getting their drink on happily. Overall I was pleased with the products and how my hair reacted with them, I have low porosity hair so it can get thirsty & I'm still dealing with my ex bleaching job which can leave hair damaged/dry but this surprised me a lot for my curly locks. Have you ever tried anything from Dermalogica's hair range? I've never tried their hair products, but their skin products are phenomenal! I've never tried anything from Dermalogica, but these sounds really fantastic. I have a super sensitive scalp, so I feel like these would actually be quite gentle on it. Oooooh didn't know they did hair products either but I am liking the sound of this for my hair is thirsty too! I have no clue what works for my skin anymore apart from Acqueous cream and Coconut oil...maybe its my time stamp lolol!